Can it topple Monster Hunter? Lewis isn't so sure. Having had a Founders Pack for some time, I’ve probably invested around 50 hours into Dauntless. That’s not a lot, and while open Beta is very much underway, I wanted to share my early thoughts on two key areas: the pace of the game, and its combat. 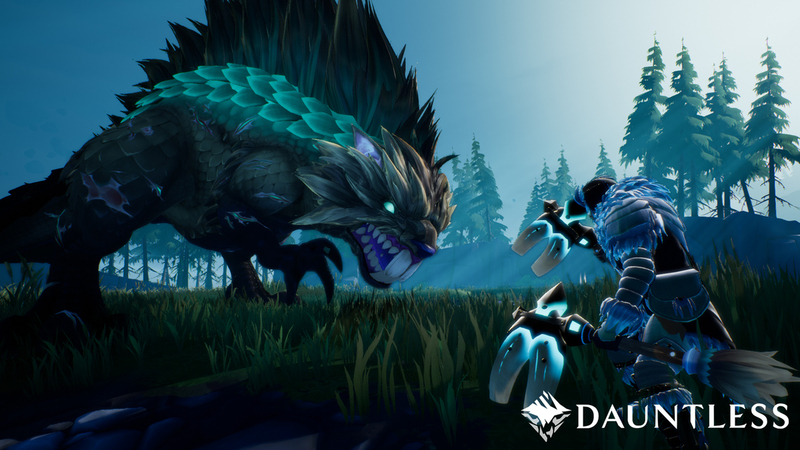 Fundamental to Dauntless’ survivability as a free to play title is to ensure that its combat, and its Behemoth encounters, are not only fun, but action packed, challenging and satisfying. It’s inevitable that most who have played an MMO, or any third-person action game, will place a great deal of emphasis on these components, and should one of them fall, there’s all likelihood they won’t stick around for long. Where Dauntless is concerned, there’s no doubt that Phoenix Labs have succeeded in creating a gorgeous artstyle, with Behemoths that are visually imposing, yet I’m nagged by the feeling that what surrounds the world and its flying airships fails to surpass the dungeon and raid experience that’s offered by the majority of its peers. 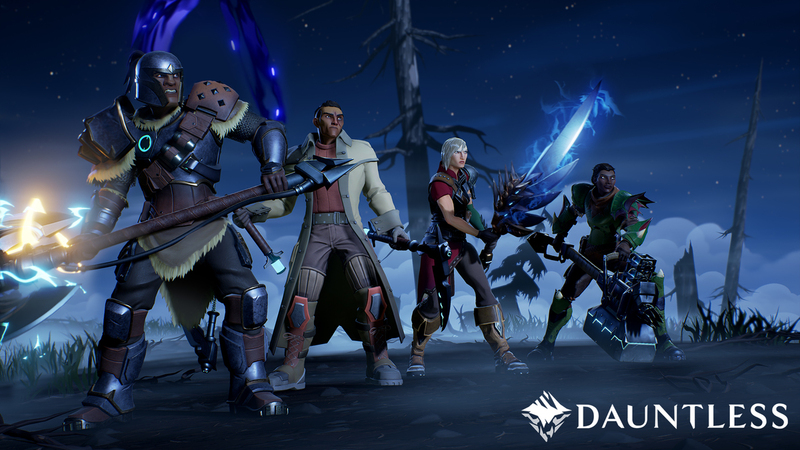 Dauntless isn’t trying to be an MMO, but it is trying to recreate some of the feelings that large-scale encounters and group camaraderie give. The game plays like a sexxed up Phantasy Star Online, but strips this back even further by leaping straight to the meat of the genre, by doing away with everything but boss encounters. On paper it sounds great, but it’s an approach that’s also devoid of atmosphere and anticipation, largely because of the fact you’re missing the starter and main course, and diving straight into the dessert. Part of the reason why dungeons and raids are exciting affairs in MMOs is because there’s room for error on route to a final encounter. There’s a nervousness to each mob pack on the lead up, in the knowledge that things can go very wrong, very quickly. Worming your way slowly to a powerful enemy - and its mini-bosses - is distinctly absent from Dauntless, as the islands you descend onto are devoid of life, bar the roars of your prey and a smattering of harvestable resources. This not only makes the game world feel hollow, but begs the question as to why you even have to search for the Behemoth. Fundamentally, if Dauntless is intending to skip all the fluff, and if the creature is the only thing of value on the island, why not always land in front of it? Where the Behemoth’s are concerned, there’s no doubting they’re intimidating, visually stunning, and animated wonderfully, but early encounters see them offer little in the way of challenge or complex skill-sets. Their rotations are easily determined, and fights quickly descend into what feels like a tank and spank scenario. Phoenix Labs deserve to be commended for their attempt at adding stage-based damage to Behemoths as you wail on them, but these visual cues - indicated by cuts and scrapes on their body - do little to satiate the need for greater feedback. I’m not suggesting the game needs health bars on its Behemoths, but if you’re to physically display the health of a creature by the damage they’ve suffered, there needs to be a far greater quantity of indicators that provide clarity on the damage you've dealt, and how much there's left to deal. Right now, it feels as though you’re stuck in an endless cycle of dealing repetitive damage, with no reliable means of establishing your foes’ remaining healthpool. I appreciate that there’s an element of discovery here, and there’s a sense that you’re perhaps never supposed to truly know the healthpool of the Behemoth you’re fighting, but that doesn’t make what we have now a robust alternative to a bar or numerical indicator; far from it. As for combat, there’s a weight and quality to all the weapons that can be wielded, with use of any of them being particularly satisfying (even if there are no ranged options - why?). Slamming into a Behemoth with a sledge hammer, or cutting them down with a chain blade is fun and moreish, but there’s concerns surrounding the lack of a crosshair or a lock-on system. By doing away with both of these 3rd-person staples, Dauntless attempts to encourage players to learn the value of their weapon through play. Early combat regularly saw me miss where I was intending to hit as I got to grips with the speed and trajectory of my chosen instrument. Does this all lead to exciting combat? I’m not sure. The problem I have with the path Dauntless has taken, is that it’s trying to approach combat strategically - to make every attack matter - but hasn’t quite nailed it. Its attempted to add depth through "area" based damage and by also setting movement and combat speed far behind the likes of Bayonetta or Guild Wars 2. This provides a measured pace to the game, but it also feels pedestrian. Not only that, but without a crosshair or lock-on system, there’s a sense that the game lacks intricate precision in its approach to needling your foes, even more so when Behemoths show little reaction to your blows. Dark Souls or Blood Bourne allow you to lock-on to a target, but no one would ever question the difficulty of either game, or their skill ceiling on reliably landing your attacks or avoiding that of the enemy. Instead, the depth of these games and their approach to combat is born from a multitude of factors: the build up, the enemies skill-set and its complex telegraphs, the potential loot on offer, and the realisation that there’s a very real risk of death (and losing a great deal of progress). You cannot profess that Dauntless offers any of this, nor can you argue that it gains anything of value for the absence of a lock-on system or a crosshair. If it does, the starter experience fails spectacularly to demonstrate this. Simply put, if you’re to strip a genre down to its bare bones, the creatures on offer have to be truly terrifying to fight - with repercussions. The lack of this in Dauntless makes each encounter largely inconsequential (an issue that’s only exacerbated when you’re in a group). So does all the above mean that I dislike Dauntless? No, not at all. There’s undoubtedly something moreish about the game, but my gut instinct tells me it needs time to truly become what it has the potential to be. It’s one to watch, and one I’ll be keeping my eye on in the hopes of improvement.